I find this book an excellent guide to the identification and protection of water resources and natural environments. While the location is America the lessons can be adapted for anywhere and we can find websites equivalent to FEMA and USGS once we know what to look for, in other lands.I really like that the author early tells us that this book will help the reader to protect water resources. In other words, the reader is not being lectured to but aided and enlisted in this vital task. If you don't know the jargon, don't worry, there are explanations and diagrams to help you understand a watershed, a local basin, ground water etc. Once you know what it is you are trying to protect you can check out the plans for the area or the effect of tree removal, road salting, mining, draining etc. on the people and wildlife. Hydraulic fracking and open-cast mining are featured with a lot of information and actual cases such as Parachute Creek. When building occurs wetlands are often drained, but these low-lying areas absorb extra rainfall and river spill, so new houses are likely to flood. Dumping or dog walking in watersheds leads to contaminated drinking water. Introduced non-native plants can outcompete the local ones, including in lakes, and fertiliser runoff or bank erosion can smother a river and its fish. In one cited example, restoring large wetlands led to a drop in mosquito numbers as the creatures which fed on insects returned. The more species, including threatened species, the healthier the area. The book would serve excellently as a handbook for a person with a suitable qualification who wishes to provide expert witness advice and surveys. Information is given on carrying out a campaign about clean water, and the drawn-out process which is best tackled by keeping files and dated records. 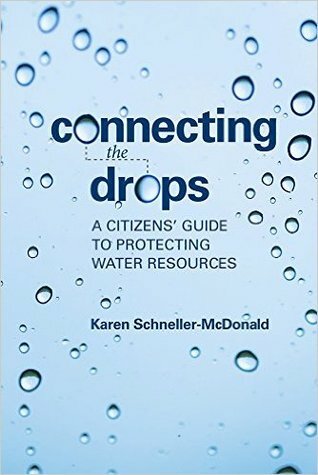 Local authorities, journalists and environmental supporters of all ages will benefit by reading Connecting The Drops. This is not intended for young people but anyone with an interest can read it and learn a lot. I saw Gary Abraham had this book. I'm not sure what I expected this book to be, but it wasn't what I expected. The author is clearly an ecologist who has been in the business of protecting water resources, especially wetlands, in the face of development for a long time. As far as I can tell, this is a technical manual on how to do what she does for citizen amateurs. The first part of the book is about what wetlands do and how to evaluate one. She imagines you're going out to a wetland and mapping its area of influence, its buffer, its extent, its flora and fauna, its geology. The information is really well organized. Just more umm, manual-like than I expected.Then you have to lead a discussion of whether the development can go forward, given what you've learned. This is the hard part. She lists a bunch of really great questions you probably need to think about, then says that the answers aren't clear cut but you should at least discuss it. Ack. This was where I was hoping to learn something specific from her experience, but it isn't there at anything greater than an occasional summary remark. She tells more stories about the ridiculous questions people ask (exposing their ignorance) than she does about the answers she gave.The final part of the book is about how hard it is to be an activist, and how you can keep your energy levels up. Really good stuff. But again, more manual-like than I expected.So... it was a weird read. It will be a wonderful manual for people who want to be watershed protection advocated. But as a book to sit down and read, it isn't especially enjoyable. Depends what you're looking for. I got a free copy of this from Net Galley.